Never store your battery in a discharged state, the battery could continue to lose more power over time and make it difficult to recharge the battery fully if taken to low. Keep your battery fully charged and in a cool and dry place with plenty of ventilation and remember to keep checking on the charge level and recharge if required. Correctly charging your battery is crucial in maintaining performance. Overcharging your battery can damage the internal structure of the battery while undercharging can shorten its lifespan. 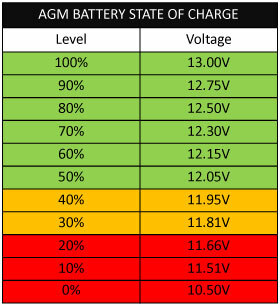 The trick is to find the correct voltage for your battery, which in the case of AGM deep cycle batteries, is 14.7v. While it is possible to charge your battery using a traditional petrol generator, most have insufficient regulators and can damage your battery if left to long. For safe and effective charging, find a good 240v battery charger, charge from the car or consider using a solar panel for a cheaper and cleaner power option. When charging from the car via the front Anderson plug fitted on your trailer, in most cases its best to have fitted a DC – DC charger in the trailer for optimum performance. The reason behind this is most cars now have a low volt output alternator (smart alternator) if you are charging from the car without the DC fitted you may not get a full charge into your batteries due to the low volt output of the alternator, the DC-DC helps generate more power to the battery, so they charge to 100% capacity. For cost effective and environmentally friendly power, consider using a solar system to charge your AGM deep cycle battery. This method is especially useful for who are without access to grid power. The power they produce can be run through a regulator set to charge AGM deep cycle batteries. While the fluctuation in power levels of 12v solar panels would damage a battery if left unregulated, using a regulator such as a MPPT Solar Charge Regulator ensures the correct voltage is consistently fed into the battery. If your trailer is fitted with a DC-DC that has a solar input, place the solar panels in the sun. You then connect the Anderson plug on the solar panel into the Anderson plug on the side of the trailer (Not through the front draw bar Anderson plug), the DC-DC will have its own built in MPPT regulator built inside the unit so there is no need for the panel to have one. If your trailer does not have a DC-DC charger the panel needs to be regulated and should be mounted on your solar panel. You will then need to connect the Anderson plug on the solar panel into the front Anderson plug on your draw bar of your trailer. A 240v ‘smart’ charger, such as the Projecta Automatic 12V 21A 6 Stage deep cycle battery charger is a great tool to accurately charge your deep cycle battery. If you have a battery charger mounted in your Trailer and the 240v installation package, plug the charger lead into the power point located next to the charger. When you plug in the 240v 15amp power lead to the side of the trailer this will activate power to all 240v power outlets and the battery charger will light up. If nothing happens then the 240v trip switch is off and will need to be in its engaged position. Make sure the battery charger is set on battery type (Normal) and the amps on (21amps) It can then decipher the voltage that best suits that type of battery, meaning you don’t need to worry about overcharging or even removing the battery from the charger when it’s finished as it will go into float mode once full. When you are plugged into 240v power you do not require solar, as the battery charger we just went through is charging the batteries for you. Note: We do not recommend leaving the charger running full time 24/7 while in storage. It is not recommended to take your batteries power below 40%, sometimes this is unavoidable but try not to take the battery into the red as it can damage the battery cells. If this does happen the battery may not hold its charge again. The more you maintain your battery charge the longer it will last you. If you have any issues or are not understanding the information in this document, please call as we would be happy to help.